I found myself wandering around in my map files the other day, and I was struck by this 1820 map of the city. I noticed two things of particular importance. 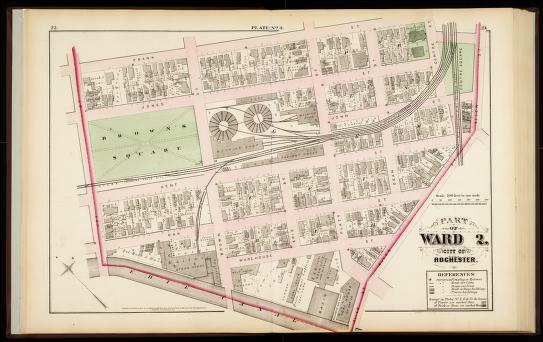 In the lower right of the map, there is an open space labeled “Public Square.” I know this place quite well – it’s Washington Square Park, where the Soldiers and Sailors Monument stands (sculpted by Leonard Volk, in 1892), the one surmounted by A. Lincoln. The land for the Square was generously given as open space forever by one Elisha Johnson, in 1817. So it makes the 1820 map. The Square is mostly empty now, what with 4G and DWTS and all, but it still is a lovely place to stroll. Not that anybody strolls downtown much anymore. Still, it is a nice space. I was strolling there the other evening, and admiring the monument. But I was almost bulldozed by a gang of skateboarders doing their damnedest to wreck the thing. And yet, it really is a nice urban space. Honest. But that’s not what really touched my sense of curiosity. 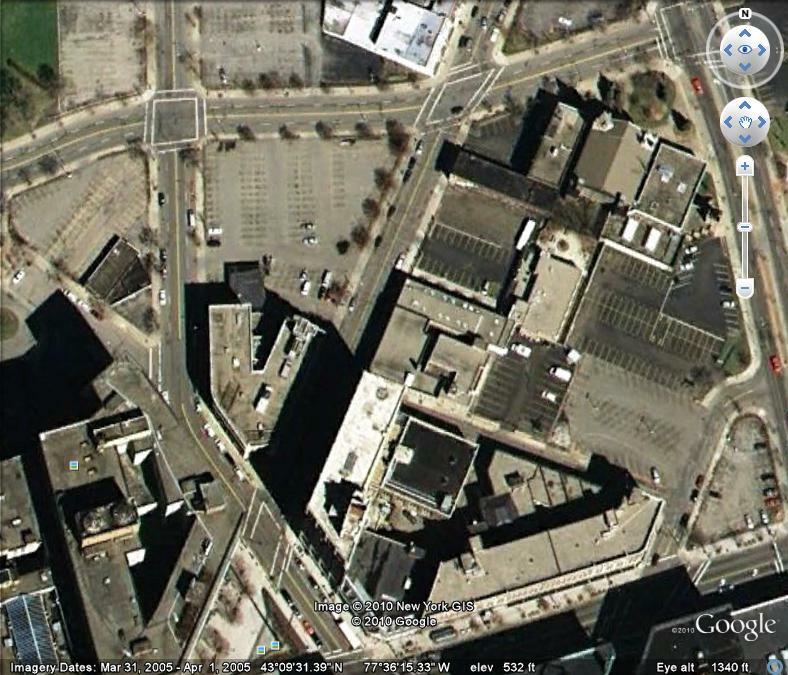 In the upper left of the map, there is another space labeled “Public Square,” and this one too still exists. It’s Brown Square, and was given by the Brown Brothers likewise prior to the 1820 map. 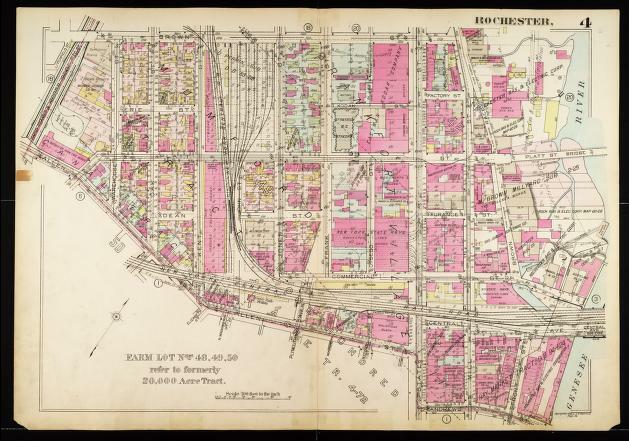 The Browns owned 200 acres or so of land abutting and immediately north of Colonel Rochester’s 100 acre tract, and conjoining their holdings was central to the creation of the city. I had a dim memory of Brown’s Square, or Brown Square as it is called today. It’s over by the baseball stadium, a block from Kodak Headquarters. Railroads run by it, I could recall. And it’s pretty plain vanilla stuff. And lumpy I remembered – filled with grass-covered berms. But it too is still there. So I thought I would wander around the Square and get to know a bit of its story. I was in for a bit of a shock. Now some of you, my dear readers, must be convinced by now that I am taken by places in the city that are fuzzy and warm and tidy. I would deny this with some vehemence, and to prove it, get comfy. 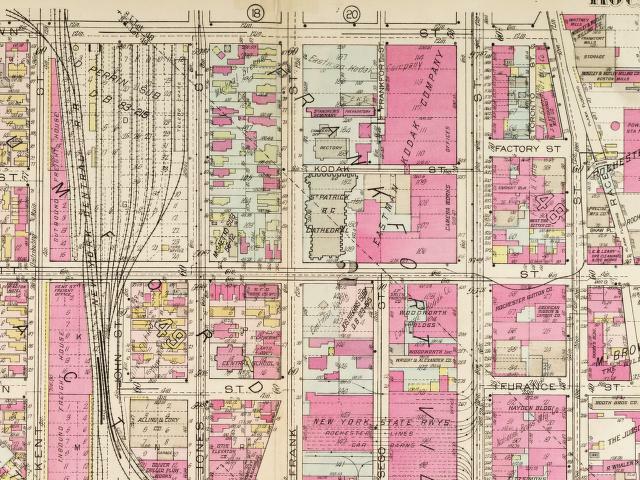 Brown Square and its neighborhood is, and always was from the first, a giant, wonderful, tangled snarl of a mess. How it and it’s surrounds survived – and one of its most important neighbors didn’t survive, but that comes later – is completely mysterious. Here we go. It’s easy to see the Square – it’s green. To the east of the Square, those round things are railroad roundhouses. 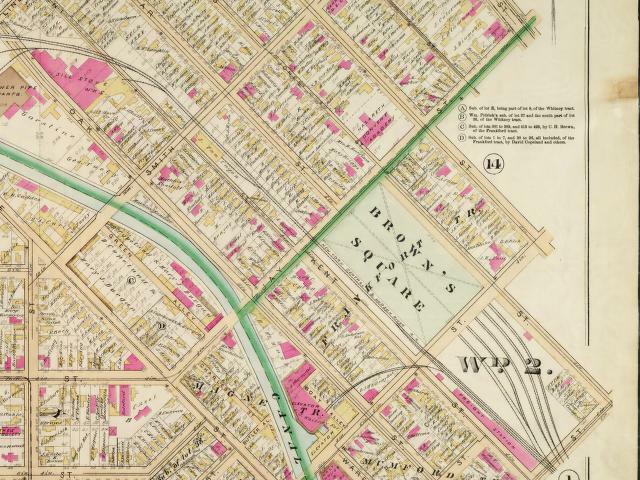 The Square’s easterly neighbor is the maintenance yard for the Buffalo and Niagara Railroad – by 1875 swallowed by the New York Central. A block and a half to the southwest is the Erie Canal. 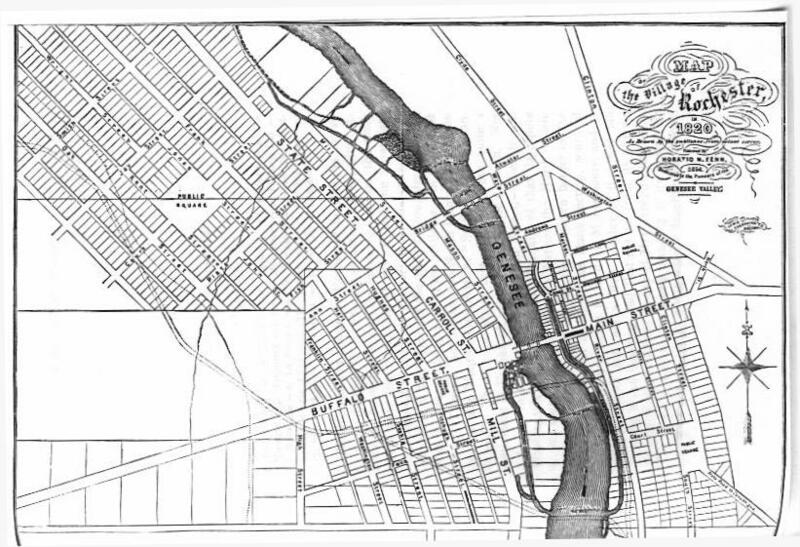 A few blocks to the northeast is the Genesee River, and all of the mill races constructed there to industrialize the city’s greatest asset – the High Falls. In this plat, the Square is surrounded on at least two sides by homes, though the ones to the west face the Square and a few active tracks. Not for long. Next comes a plat from 1888. The rail yards are a bit more extensive. 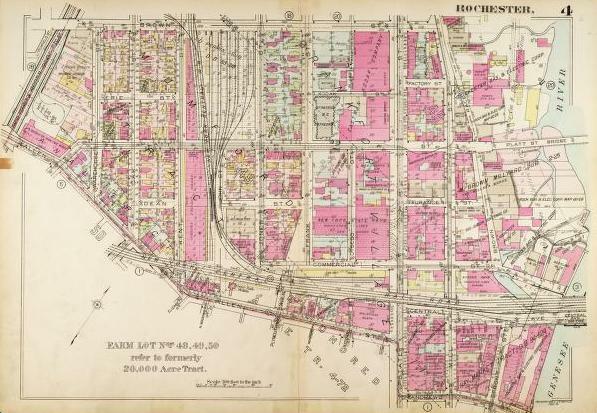 The Square, bounded by Brown, Jay, Kent and Jones Streets, is still cut off from the homes to the west – tracks continue between the Square and the homes on Kent. And there are more large pink blobs – factories and warehouses. 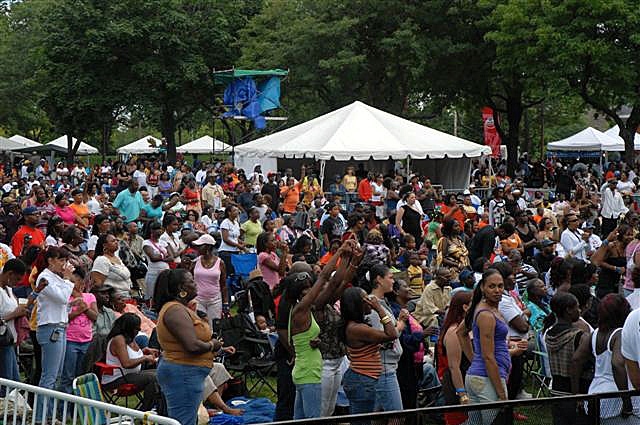 Nonetheless, the Square was filled with life and exuberance. 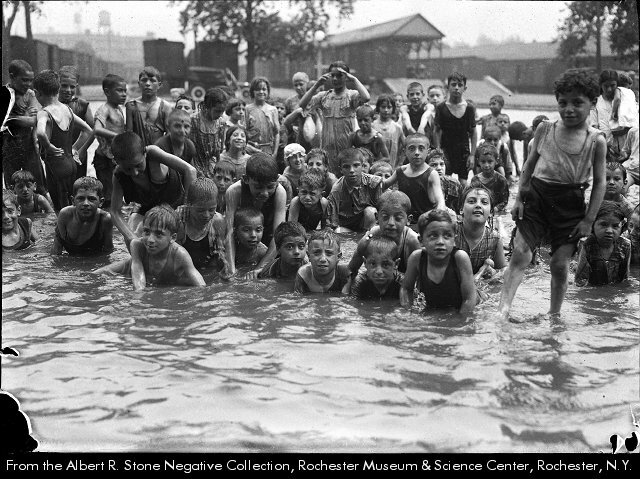 Mr. Stone took many pictures of the action here in the first decades of the 20th century, as did others. Here’s a sampling. 1903. Looks bucolic, but remember, the railroad is rumbling on at least two sides of this place. 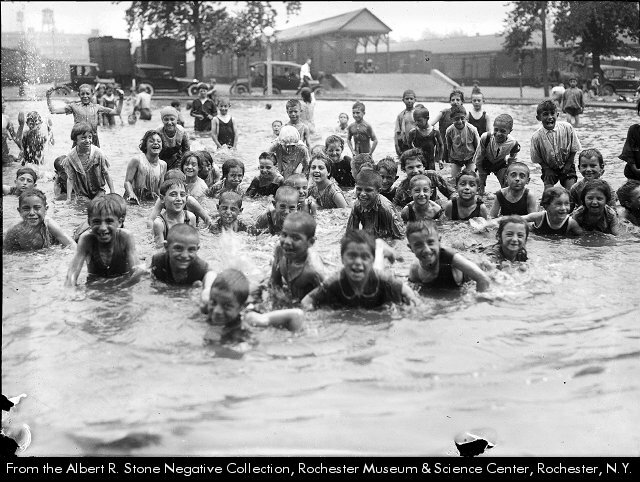 Mr. Stone was so taken with all these kids, that in 1913 he took two shots. I like the next one better. The rail yard is crystal clear in the background of these two shots. I wonder what Mr. Stone said to the kids to get them to mug for him? 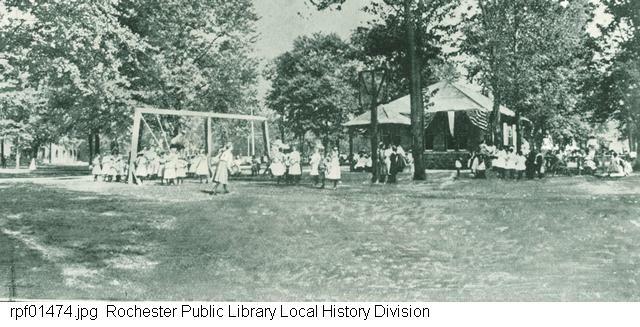 In 1921, the Square’s field house was home to a branch of the library. 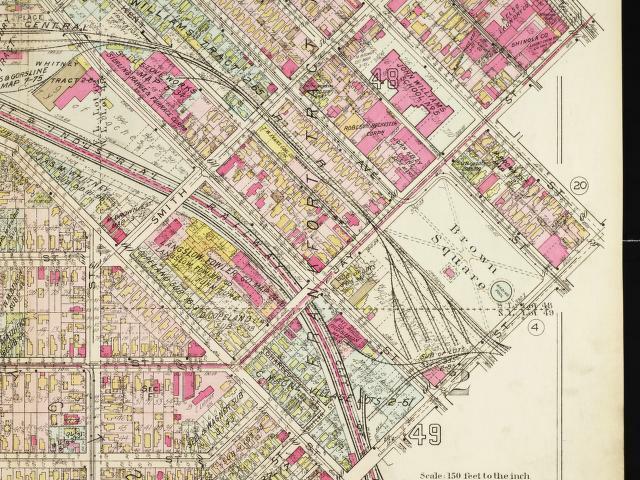 Brown Square existed at the farthest eastern edge of what was, and still is, called Dutchtown. 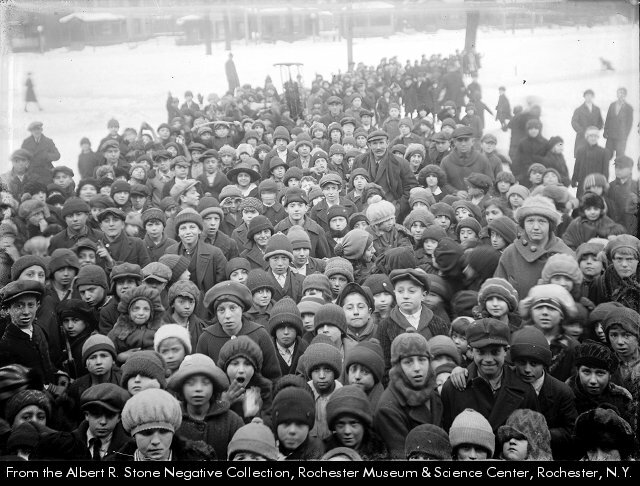 Dutchtown was filled with many thousands of immigrants, starting in the late 19th century. Germans (it was originally Deutschtown), Irish, Italians, and lots of others, mostly workers. And, obviously, lots of kids. 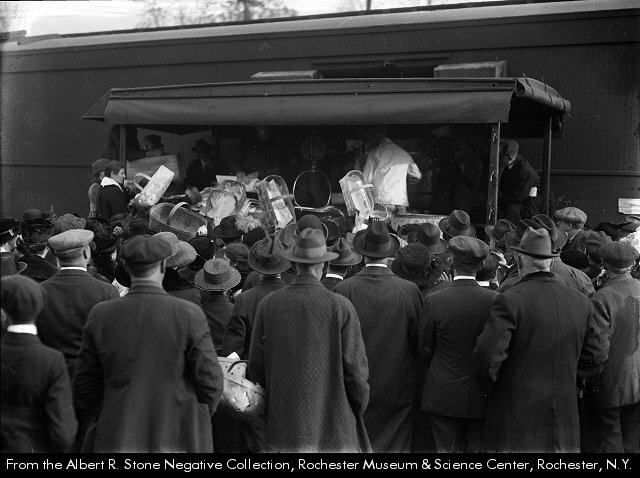 In 1919 some enterprising soul brought a rail car from Boston filled with fresh seafood. He parked the rail car on Kent Street, against the Square, and there was an instant feeding frenzy. 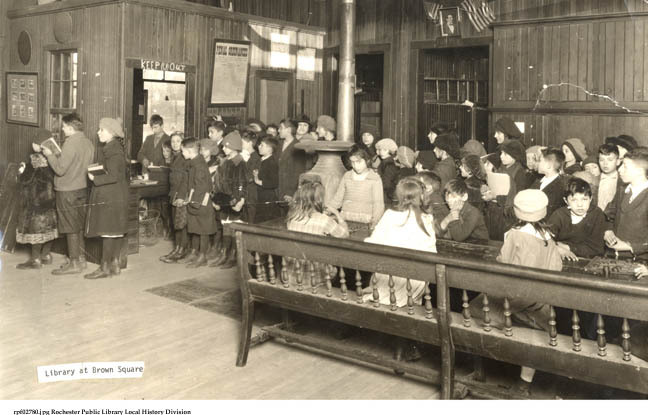 And in 1922, at Christmas, the kids were lined up for “Christmas Tree Exercises,” whatever they were. Maybe one of you knows. Then comes the plat from 1926. Things are getting a bit dicier for the neighborhood. The Kent Street homes are gone – the railroad has claimed them for an expanded rail yard. The Erie Canal is gone, too, replaced by what is called an Industrial Railway – it’s the city’s oft lamented subway, here riding in an open cut in the ground. And now let’s travel a block to the south, to Frankfort (now Plymouth) and Platt. 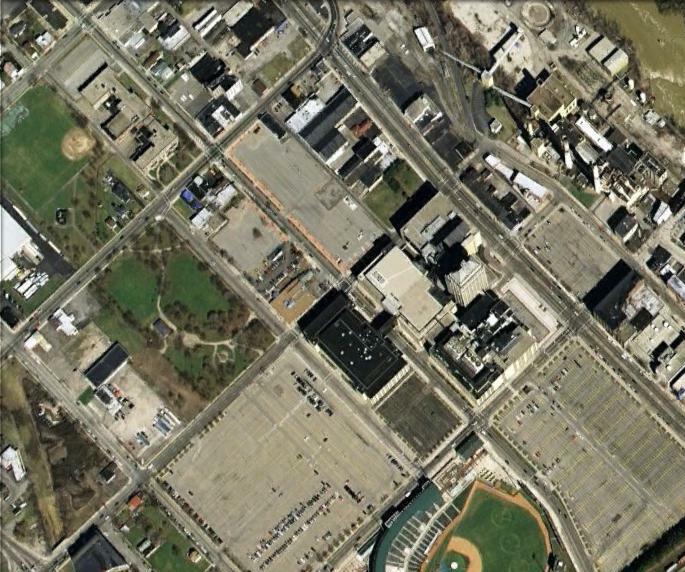 Brown Square is at the top of the railyard, just off this plat. In the middle of the image, near the big number 2, is St. Patrick’s Cathedral. 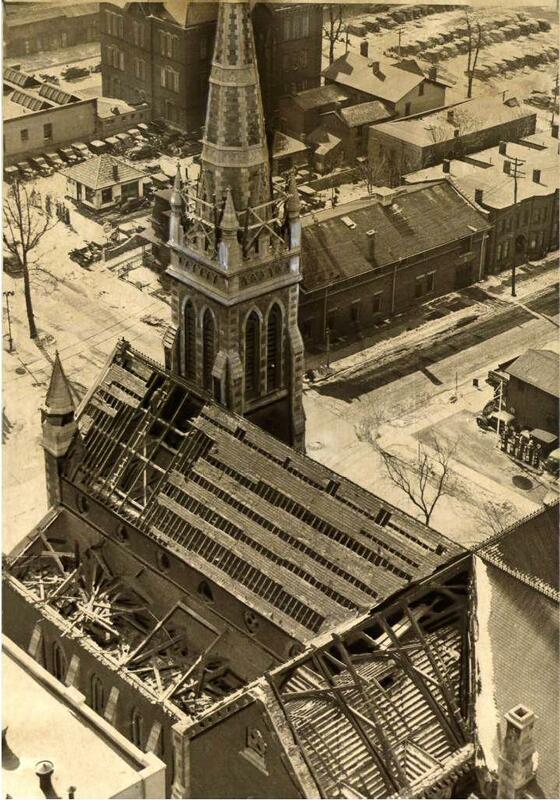 And here is what the Cathedral looked like in 1896. There had been a church here on this site since the 1820s. Yes, that’s a factory next door to the church. In fact, It’s Eastman Kodak. Not exactly a tame and sedate urban view. Because it was a Cathedral, it was the site of all kinds of important events. 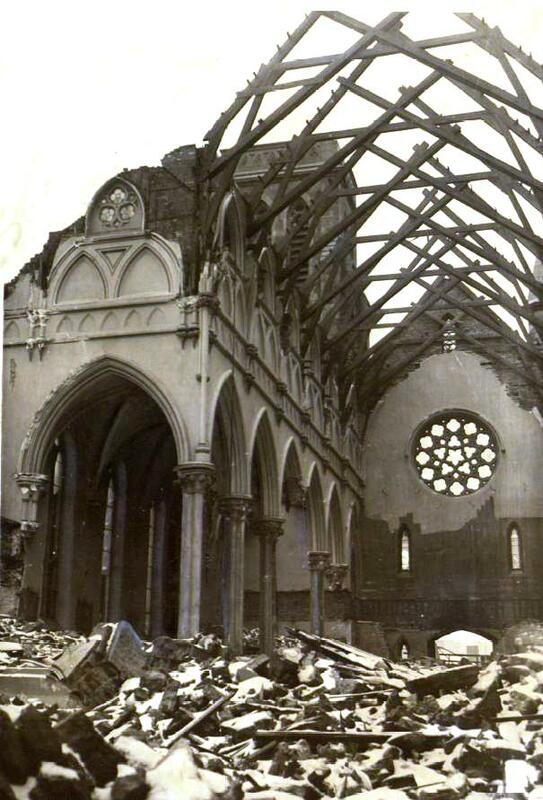 Let’s take a look at the Cathedral’s interior, from some time in the 1920s. 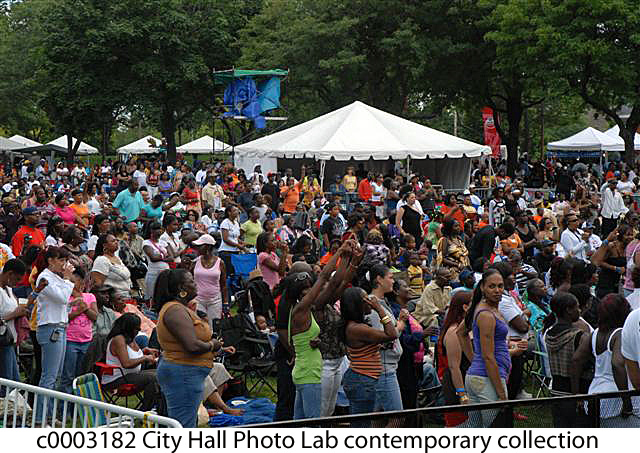 Not sure what the event was, but the place was packed. Looks like a funeral, but I’m not sure. 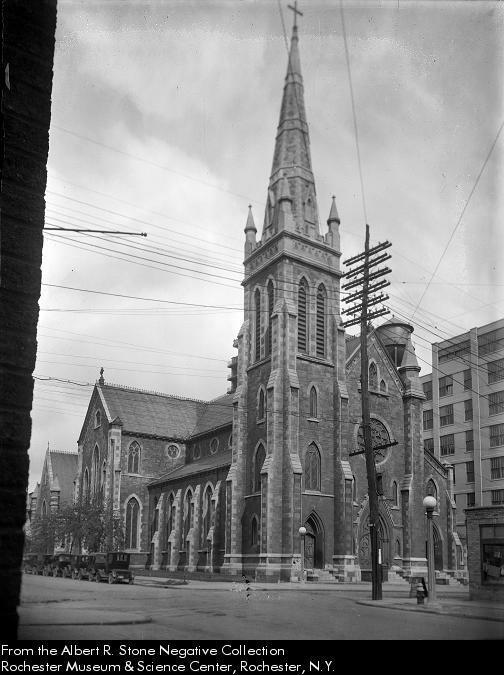 By the mid 1930s the Cathedral was surrounded by Kodak. 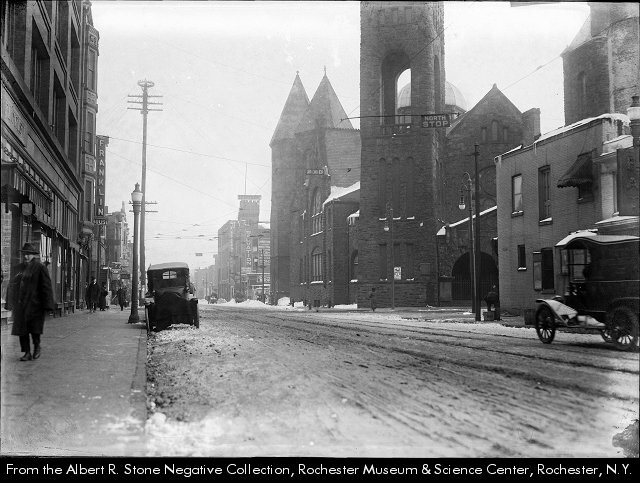 Here’s a view showing the church with Kodak Tower looming above. I believe that this postcard image has been, um, photoshopped. 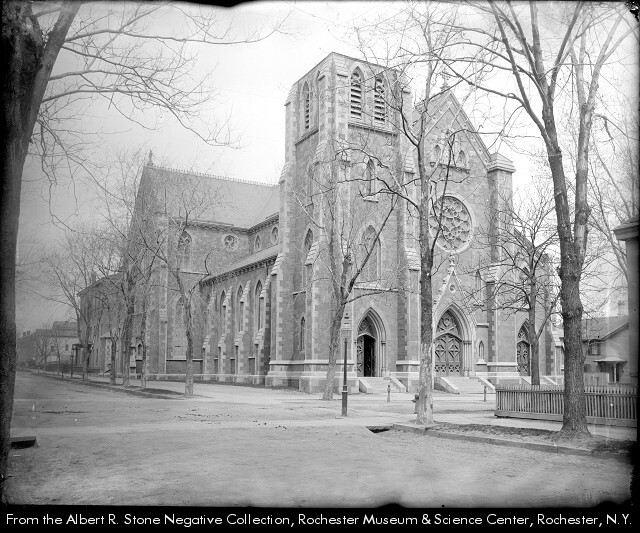 The picture of the Cathedral is from Mr. Stone’s 1923 image, above. Kodak Tower has been added in the background. And then – wait for it – KABOOM! 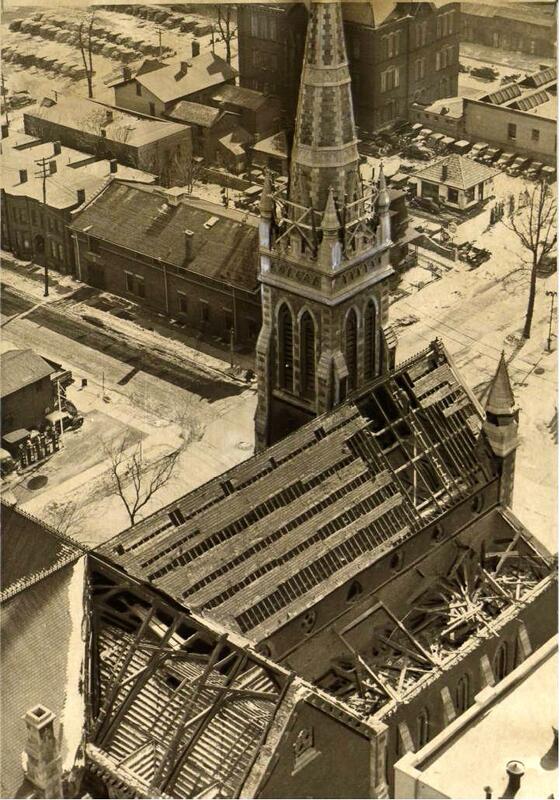 Kodak acquired the Cathedral in September of 1937, for $350,000, and then tore it down, to make way for further corporate expansion. Please do note all the parked cars in this aerial view. I discovered, as I looked into this bit or our story, that in the preceding years Kodak had made other offers to buy the church. Apparently the diocese was slow in considering these offers, and they were never accepted. But several things seem clear by 1937. The diocese was strapped for cash – the depression had clearly been felt – and there were a handful of churches nearby that the parishioners could use as alternates. What Kodak got in the deal was the Cathedral, the rectory, and several other buildings in that block between Platt and Brown. 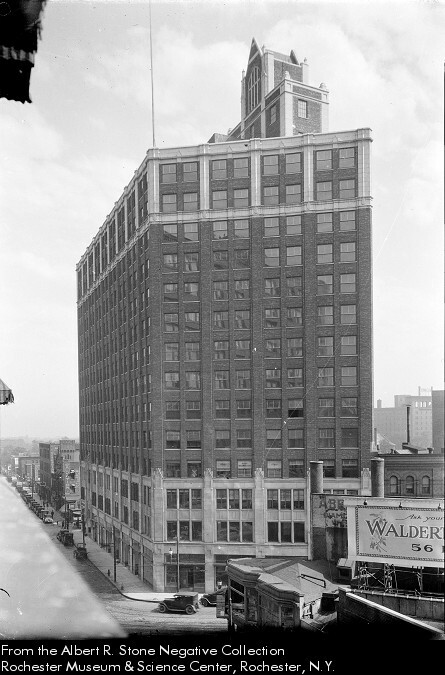 A year later construction had begun on the site, and the explosive expansion of the Company ($18 million a year in capital improvements in the late 30s – and well into the middle $50 millions by the mid 50s) continued. 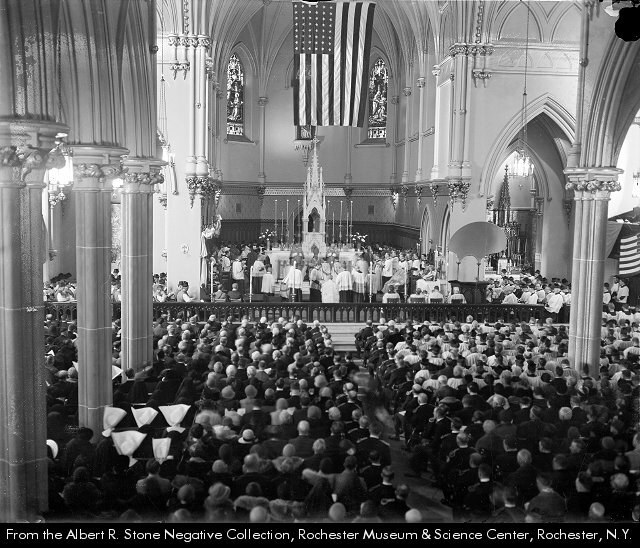 I have combed through the newspapers of the day, and while there was some solemnity about the passing of the Cathedral, and a party line from both Kodak and the diocese that got repeated ad nauseam (Kodak: our facilities are maxed out – we need room to grow; diocese: we’re surrounded, our faithful can go elsewhere, and we need the cash), there was not much hand wringing or whining. I suppose that first, parishioners must have seen this coming – there were other offers. 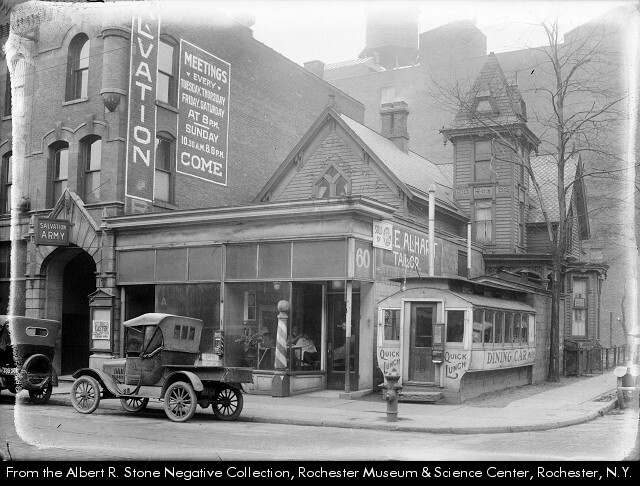 And next, Kodak was the roaring engine not just of this neighborhood, but of the city, and the region. Don’t bite the hand that feeds. So in an instant, the church was gone. At least it didn’t become a parking lot…. Unlike much of the neighborhood surrounding the Square. 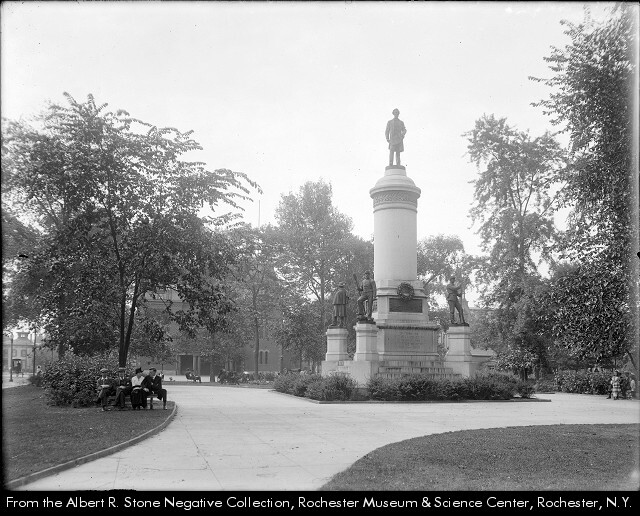 Today Brown Square remains, and while it is not nearly as seductive as it once may have been, it is still there – as a regular venue for events in Rochester’s wonderful world of music, as an example. 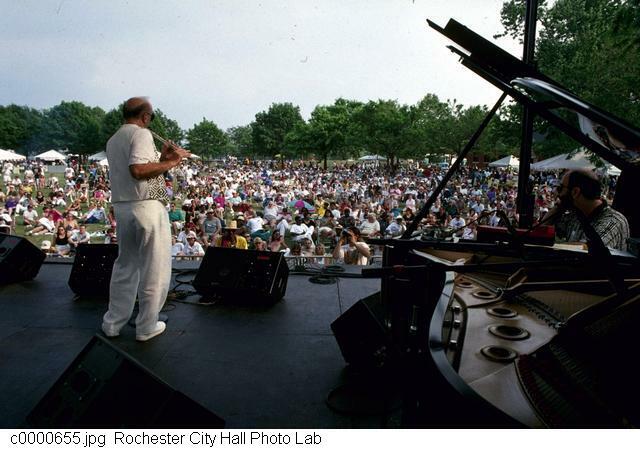 That’s jazz flutist Herbie Mann, onstage in the Square in 1995. And in 2009 the tradition continued. From The City Hall Photo Lab collection. Somehow Brown Square has survived all manner of the enormous pressures of change. But change has not been kind to the neighborhood – there’s not much left but Kodak and the Red Wing’s ballyard. It’s amazing it made it. As I look at a century or so in this part of our city, read the newspapers, look at the images, get to know the places and a few of the faces, and recognize the fast pace of change, I understand how we ended up with what is, essentially, a kind of twilight zone, in place of what was a vital, albeit messy, urbanism. We made our choices. We thought it was progress. It wasn’t. Block by block, I am slowly piecing together a lost city. 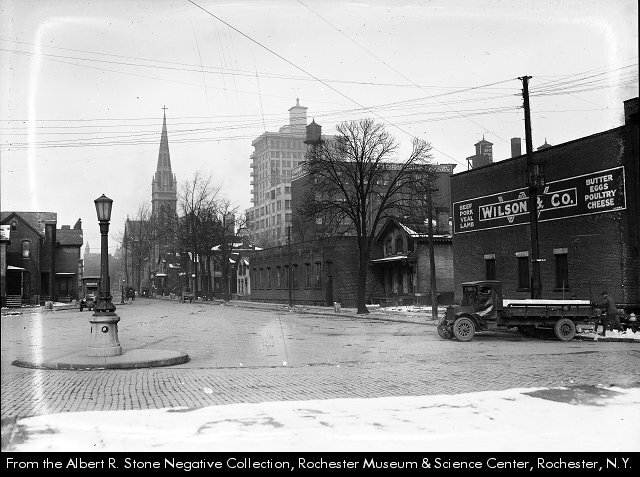 The more I unearth, the more I am fascinated by what was once Rochester. The fineness of urban texture, the richness of that urban life a century ago, is long gone now. But the traces are beguiling, sometimes sad, and always suggestive. As I sift through the images, I can hear the life on the street, and almost smell the lunches being prepared at Mike Miller’s diner, at 60 North Street. Let’s go for a walk. 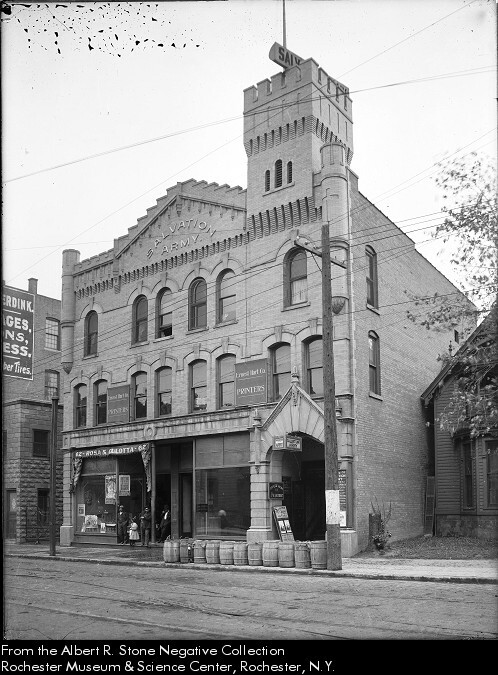 This is the Salvation Army’s Citadel Building, on the east side of North Street (now Liberty Pole Way…. ), in 1907. Notice the little house to the right in this photo – you’ll see it again a few more times. To the right of the house is Achilles Street – named after a Civil War veteran and city benefactor, Henry L. Achilles. So: the intersection of Achilles and North. Sometime in the early teens, Mike Miller came to North Street. Mike found an old rail car somewhere, and decided it would make a great place in which to open a diner. 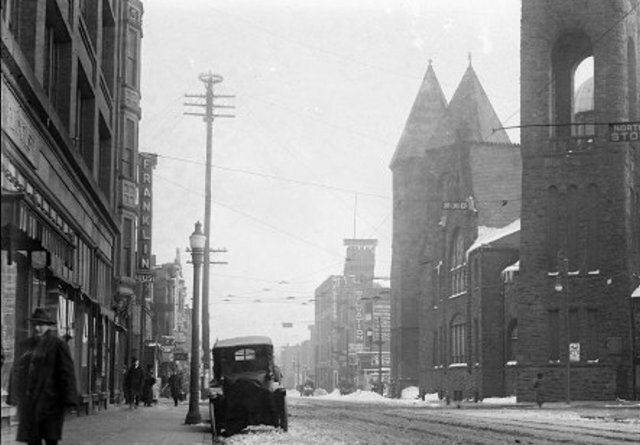 Which he did – here’s a view in about 1914. He’s set his diner against the wall of the Salvation Army, and on the front lawn of the little house. Always open, day and night, ladies and gents. 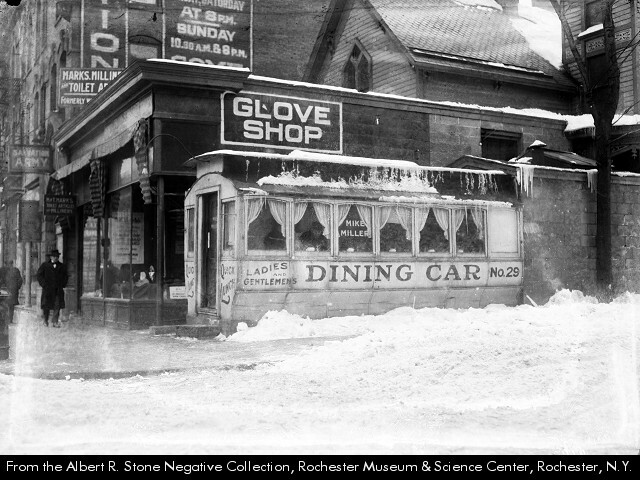 In 1917, the lettering on the diner had changed, as had the weather, but Mike was still at it. Only now, an addition to the little house made a storefront for a glove shop, and Mike and his diner had slid a bit south. Now Mike was right at the intersection of North and Achilles. Dining Car No. 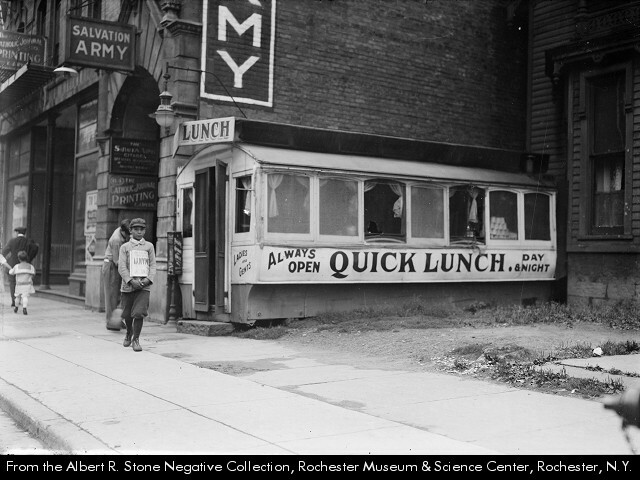 29 must have been a good place to grab a meal – by 1917, Mike’s name was in the window. And two years later, Mike was still at it. The glove shop had become a tailor, but Mike soldiered on, serving up his quick lunch. Directly across the street, there were other little establishments – a jeweler, a laundry, another lunch spot. Mr. Stone must have just had two eggs over easy at Mike’s before he made this image. Around this time there was a murder in the neighborhood. Mike’s night clerk, Bill Kelly, who was all of 18, was slain by a fellow named Tony Chireco, aged 20, from Buffalo. It was big news, so Mr. Stone was on the scene. The murder happened right outside the diner, next to the church. If we enlarge the photo, we can see the crime scene. Mike’s diner is just beyond the church, below the Salvation sign. 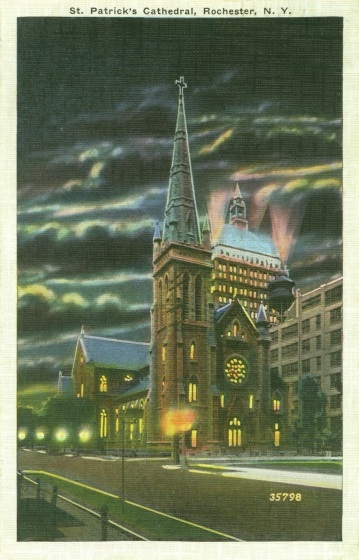 Later the church was demolished – Second Baptist – to make way for the formidable Baptist Temple, which remains in place today. Stone took a picture of the Temple in 1925, two years after it was completed. 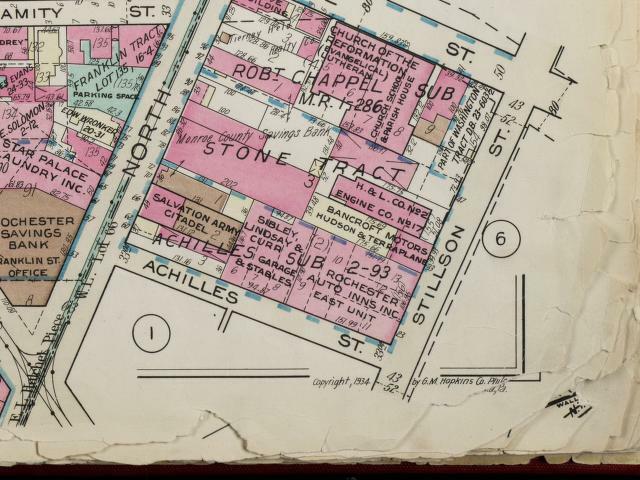 Mike’s diner is still there, at the lower left of this image, across Achilles Street from the Temple. Here’s another view. By this time – 1925 – Mike had been at it for over a decade. 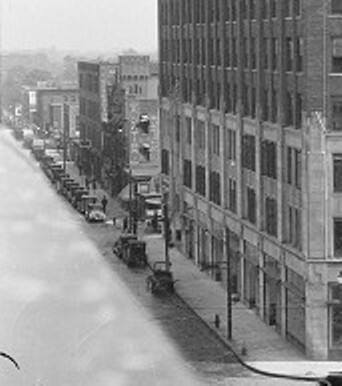 Ten years later, in 1935, a view of the City Plat is equivocal. The Salvation Army Citadel is still there. The little house with the storefront addition is still there. 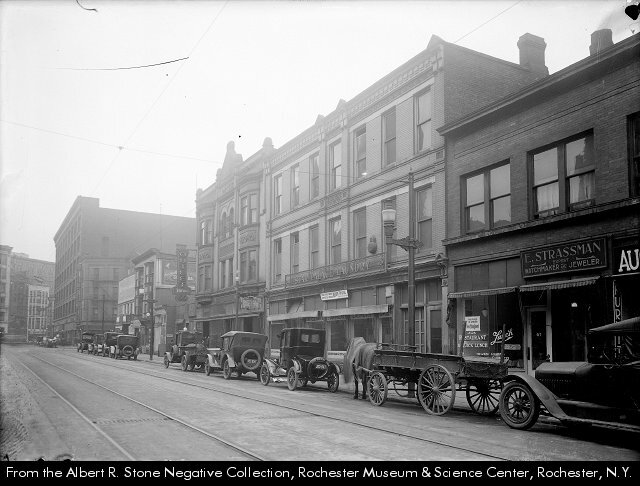 The Star Palace Laundry, across the street, is still there. Is the diner? Not sure. It appears that there is a dotted line next to the storefront addition that could be Mike’s diner. Would the City have platted a railroad car sitting on someone’s lawn? Hard to say. Today the stories of North Street, Mike’s diner, quick lunches, bustling sidewalks, crimes in the night, and clattering streetcars are all vanished. Here’s the intersection of North and Achilles today, oriented just like the City Plat, above. I am reminded of something Christopher Lasch wrote, in a book entitled “The True and Only Heaven: Progress and Its Critics.” He was making a distinction between nostalgia, which freezes and idealizes our past, and real living memory, which leads us to our future. Thanks to Mike Miller, and 60 North Street, I, for one, expect more for our city. 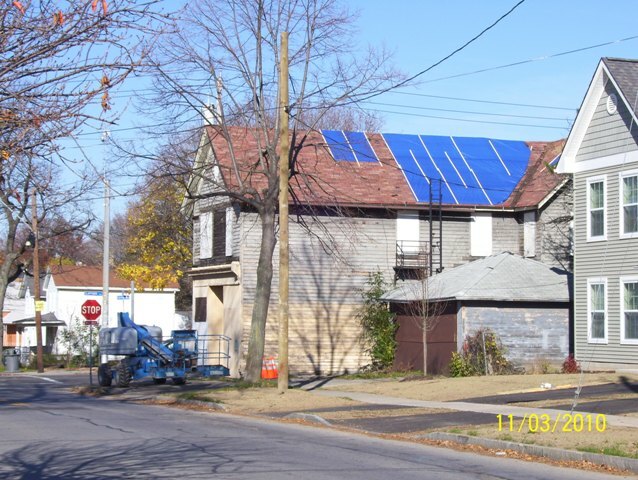 Roof tarped and holes covered, thanks to the City of Rochester.